Frustrating to the left wing media and the open borders crowd, no court can successfully demand the President of the United States of America to stop border enforcement. This is why it’s crucial to have a strong DHS Secretary focused on stopping illegal entry. 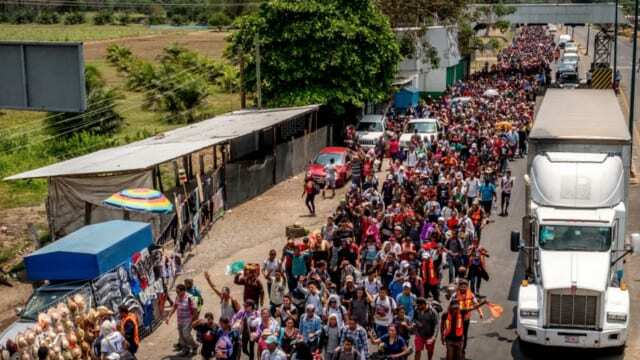 There’s a not so silent rage here in America concerning the Tsunami of Caravans from Honduras, Africa, the Middle East and other oppressed countries making their way through Mexico illegally trying to invade the United States of America. Conversations regarding the invasion add to the exhaustion of the eight years of tyranny by the prior administration that our great nation had experienced by anti Americans at the helm, making this years Thanksgiving across our country extra special giving praise and thanks for our blessings, and be sure that many grateful patriots will include President Trump in their prayers as tens of millions of Americans voted for this President nearly two years ago. His popularity increases daily despite the deranged illusions we see and hear echoed through the parroting of most left wing news media which is historically owned by those giving our country away. It is through this darkness, the light does shine, as this new emergency of invasion we face today against us is the aiding and abetting of foreign forces by domestic terrorist disguised by their robes, suites, military and political attire, as they weaponize their fascist Anti American credo against ours using and abusing their professional platforms. Let us remind these seditious soulless wonders that the eight bleak years Americans witnessed in horror the mishaps of negligence, and dereliction of duties from the former 44th commander in chief who colluded with our enemies is the very climate that created President Trump’s growth and popularity. Americans are strongly vigilant, keeping focused on our borders, eyes in the skies, land, air and sea, as well as underground, not only is our military packing a punch against those alleged enemies of the United Nations, George Soros, Corporations and other left wing organizations who have financed and organized this sinister cluster of people pawns invading our borders, but they will be met with swift justice, and be sure, we know who you are! We have every militia created by man ready and waiting, granny’s with guns and an attitude to boot, who only need one good reason to shoot, as well as red, white and blue Americans who were either born here or “legally” conformed to our laws. Patriots will no longer allow for the worn out tactics of emotions played upon our empathy redefining the narrative of apathy to be used as weapons against us. We are aware through the department of homeland security and intelligence agencies that there are over 500 hardened criminals hidden within these caravans trying to infiltrate our home. This is America, the home of the free because of the brave, We will not stand for any criminal enterprise or displaced entity’s to dance on the graves of our fallen who have sacrificed their lives for our sovereignty. Our modern day protectors have risen up to this challenge and Americans will NOT tolerate any more treasonous, seditious acts in the form of a trojan horse or Jade helm treachery. We wear our Constitution like a Cavalier vest and our laws are enforced through our President who works for “We The People”. These are not threats they are promises, and if you’re an enemy reading this, wanting to try us on for size, enter at your own risk because justice will be swift and unpleasant, this President of the United States of America and his patriot supporters have come together in the name of freedom and will do everything in our God given power, within the laws of our Constitution, to protect our innocent. Parts of Mexico and three Central American countries of Honduras, El Salvador and Guatemala have filed a protest with the Inter-American Commission on Human Rights over President Trump’s new asylum policy, arguing their citizens should be allowed to flee their countries seeking refuge in the U.S. Despite the tough talk, we are still allowing fake asylum seekers from Tijuana: 40-80 per day at San Ysidro alone. They are refuged in the San Diego shelters until they find permanent homes. The asylum scam continues each day as about 600 per day along the southern border. Paul Ryan “refuses” to fix the loopholes, and Paul Ryan, the American people are closely monitoring your actions and inactions on this matter. The Mexican people stand divided in this national emergency concerning these displaced invaders trampling through their country, and although most understand the circumstances driving people to flee their country, they believe that President Trump representing the people and country of the United States have every right to protect their borders. Tijuana’s Mayor Juan Manuel Gastelum stated that President Trump was right, these caravans are an invasion and added they are a Tsunami. Those protesting Tijuana Mexicans are rising up in the name of nationalism with their spirited debates against these invaders as some of them have witnessed the lawlessness and crude acts being committed by some of the criminal elements hidden deep within the caravan, 90% men between the teen age years to middle age. There have been reports of these vagabonds demanding people out of their cars, taking their cell phones and smashing them, demanding people hand over their money. While the local gangs put these illegal visitors on notice, threatening them to leave or else pay the consequence with their lives. This past week the U.S. Customs and Border Protection temporarily closed northbound lanes at the San Ysidro Port of Entry which links San Diego and Tijuana, out of concern that some migrants might try to illegally make a run across the border. The Trump administration has warned that applicants will face long waits in detention and have little to no chance of gaining legal residence, and earlier this month the administration introduced measures to deny asylum to anyone who enters the U.S. illegally. Counter punching the Presidents orders, as a European born in London England this 9th Circuit, liberal Obama appointed Judge Jon Steven Tigar. only applies to aliens who gain illegal entry and request asylum. Nothing in the ruling stops the hardened border enforcement and /or current expedited review and deportation program. In essence, keep the illegal aliens out and the judicial ruling is moot (until defeated in higher courts). Bottom line: This ruling undermines the legal process for asylum requests by removing the distinction of illegal or unlawful conduct in the application process. It is reported that all border cities in the U.S. are being patrolled by militia, the southwest border are estimated 200 plus “unregulated armed American militia members” they operate under the guise of citizen patrols, supporting Customs and Border Protection, primarily between points of entry. Mr. President, most American patriots believe it is time to pull out of the U.N. and who the hell are they to demand that we accept these illegals into our country? We are a nation of laws. The United Nations is notorious for the globalization of genocidal eugenicist. Although their narrative speaks of protecting the innocent their back story is the contrary, and they are all about the Kalergi Plan, which in Europe today and around the globe the dissolution of the Caucasian race is apart of the power elite’s prioritized agenda. This nefarious and premeditated plan to the destruction of Caucasians has been a target since after WWII.